Parmesan Panko Crusted Chicken — another quick and easy dinner. Chicken made moist with egg, flavored with parmesan cheese and panko, then crisped in a bit of olive oil. Tender and flavorful any time, any season and picture perfect enough for guests. This is one of my “stand in the refrigerator door– what am I going to cook now?” inventions, so if you are looking for gourmet – maybe next time! I spied a jar of grated parmesan cheese in the refrigerator door, looked at the package of chicken tenderloins in the freezer next door and remembered seeing parmesan chicken on a restaurant menu once and there you go. Chicken breast tenderloins are slices of chicken breast about one half inch thick. They’re not available in all stores, but I can buy them at one of the supermarkets for the same price as boneless chicken breast. If I stock up while they are on sale, they are a very good buy for the nutrition value as well as the convenience. You can make your own by slicing boneless chicken breasts the “long way”. Panko is a relative newcomer to the pantry at Chez Charlene. I used regular bread crumbs at first, then Italian seasoned bread crumbs which we liked even better. Then I picked up a package of panko and we like the light and crispy crust it makes so that is the current choice. I haven’t experimented with seasonings to go along with the panko so feel free to add your own preferred herbs, if you want. I also don’t add salt because the cheese makes it “salty” enough for us, though you may want to add a touch to the crumb and cheese mix. Wheels adds pepper to his serving. Beat the egg till thoroughly mixed. One large egg will cover about 12 tenderloins, add a bit of water to stretch it if you are going to double this recipe. Dip the tenderloin first into the egg and then into the crumb and cheese mixture and pop into the hot skillet. Discard any leftover egg or crumb mixture. It only takes about six minutes per side to cook the half inch thick pieces of chicken. Monitor the heat so the crust does not overbrown, but is still hot enough to bring the internal temperature high enough to cook the meat through. I start out with a couple tablespoons of oil in the pan and then add another tablespoon full when I turn the chicken. And sometimes if the pan or the meat seems dry, I will add more oil, about half a teaspoon at a time until the meat is frying and looking moist again. Serve with salad and vegetable of your choice and fruit for dessert. YUM! This recipe featured at Kristen’s Creations. Quick and easy and delicious -- a go to meal in a time crunch. Add 2 tablespoons olive oil to 12 inch pan and begin to heat on medium high heat. Oil is ready when a bit of egg or crumb is dropped in and sizzles. Mix parmesan cheese and crumbs together in a saucer or small plate. Beat egg in second saucer or small plate. Dip each tenderloin in egg and then roll in crumb and cheese mixture. Cook in open skillet for 6 minutes, lower heat if necessary to prevent over browning. Turn chicken, adding additional olive oil to prevent sticking. Cook for another 6 minutes. Looks tasty. This would go great over a nice green salad…yum! I found your post threw Living well with Less. The recipe you posted about for the Panko Chicken looks really good. I am definately going to be giving this a try this weekend. I just need to get the Panko. Love this chicken! So simple and elegant! This looks so delicious!!! I’m definitely going to have to try this recipe! Thanks for sharing – I’m visiting from the Etcetorize link up party. 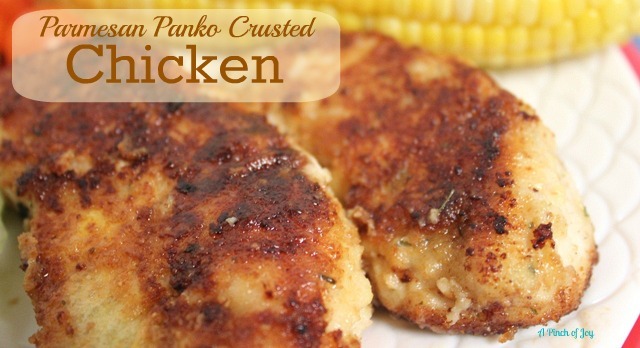 i make a panko + parmesan-crusted chicken, too! It’s one of my all-time favorite weeknight dinners. yours looks awesome! Looks yummy. I like to use panko in my cooking!! I would love for you to link up to my linky party at The Mandatory Mooch. Still open for another day!! This looks yummy… Would love it if you would share it or any other recipe that you have to our Linky Party that starts shortly. Great giveaway for the Top 3 Voted Recipes.